You can get more tips on using fragrance diffusers here. Reed is very porous and excellent for diffusion and pulls up the liquid from bottom to the top and releases the fragrance into the air. 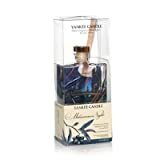 This process can last for a considerable period of time and when the fragrance becomes less intense the reed sticks can be flipped over and the air is ready to be filled with the natural fragrance once again. Bamboo or wood sticks are also available but many believe they do not have the diffusion properties present in the reed sticks. If the intensity of the fragrance in not to the optimum it needs to be seen that the essential oil is at a reasonable level in the bottle in which the reeds are placed. The level should not be very low and at the same time should not be touching the brim to cause spillage. Also the placement of the reed home fragrance diffuser also affects the intensity of the fragrance. If the diffuser is placed in an open area, then the fragrance will be more freely mixed in the air. However, if is placed in a covered corner, the air will not circulate so freely around it and the intensity of fragrance will build up in that area. 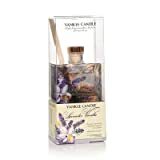 Reed home fragrance diffusers are the perfect method for elevating the mood and spirits by experiencing fragrances in the most simplistic and natural way as they can be used in different areas of a home with a variety of essential oils. These can create various moods in all settings and thus make the perfect environment for each and every room of the home.